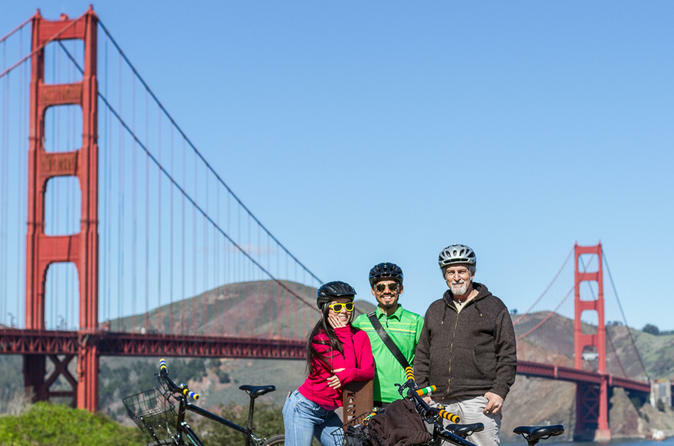 This tour, with San Francisco's highest-rated guided bike tour company, is considered the world's most popular scenic bike ride. The 8-mile route runs along San Francisco's Marina waterfront, over the world-famous Golden Gate Bridge, and into the picturesque, bayside town of Sausalito. We ride at a casual pace on a mostly flat bike path, stopping to take in views and learn about San Francisco's wild and storied history along the way. The tour is 2.25 to 3 hours long, and the price includes bicycle, helmet, and guide. Once the tour ends in Sausalito, the bikes are yours to keep for the whole day. You can return to San Francisco from Sausalito by taking a ferry (bringing your bike with you) or by riding back to San Francisco. Ferry tickets back to San Francisco are additional. Starting in Fisherman’s Wharf, our route takes you along the San Francisco Bay waterfront, through Fort Mason, the Marina, Crissy Field in the Presidio, over the Golden Gate Bridge, and down to the picturesque town of Sausalito, just north of the bridge. Stops might include the municipal pier in Fisherman's Wharf, Fort Mason, the Marina, Palace of Fine Arts, Crissy Field, the Golden Gate Bridge, and Sausalito. Once the tour finishes in Sausalito, guests are encouraged to have lunch in Sausalito and bring their bikes on the ferry back to San Francisco. The Blue & Gold Fleet ferry disembarks in Fisherman’s Wharf, about 5 minutes from our starting location. You can use the bikes to explore the rest of the day. Bikes need to be back at the shop before closing time.